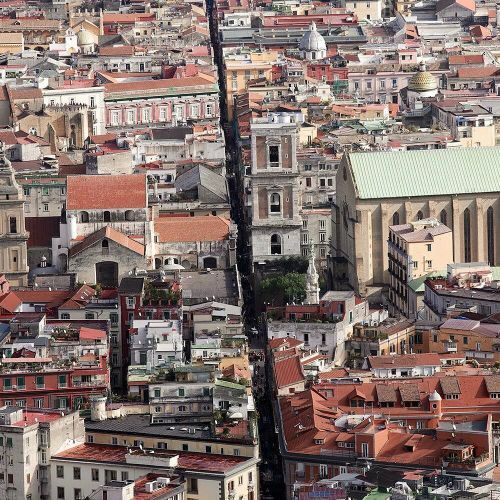 "The narrow street #Spaccanapoli cuts through the historic center of #Naples. The writer @annmahnet traveled here recently without a guidebook or even a map. Instead, she armed herself with the writer Elena Ferrante's series of best-selling novels and searched for an Italian city that has become a character itself: dangerous, dirty and seductive, the place everyone yearns to leave behind, and the place they can't shake. Elena Ferrante is the pseudonym for the author, who has become one of modern literature's greatest enigmas — media-averse and resolutely anonymous. The publisher's official biography offers a single personal detail: "Elena Ferrante was born in Naples." Visit the link in our profile to read the @nytimestravel story and see more scenes from Naples captured by the photographer Chris Warde-Jones." By nytimes on Instagram.